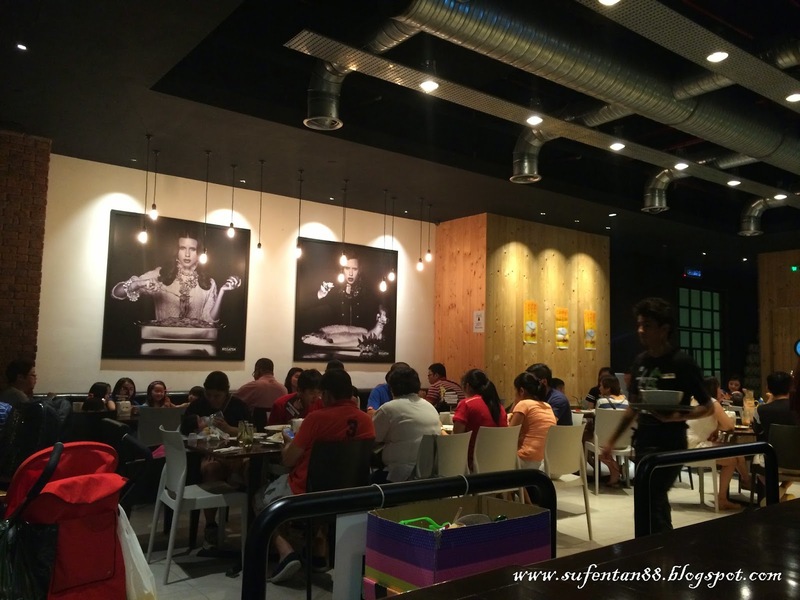 Previously during their opening, we didn't manage to find and try out their food. So this time round, we purposely come all the way from PJ to search for it and I could say I have no regret. 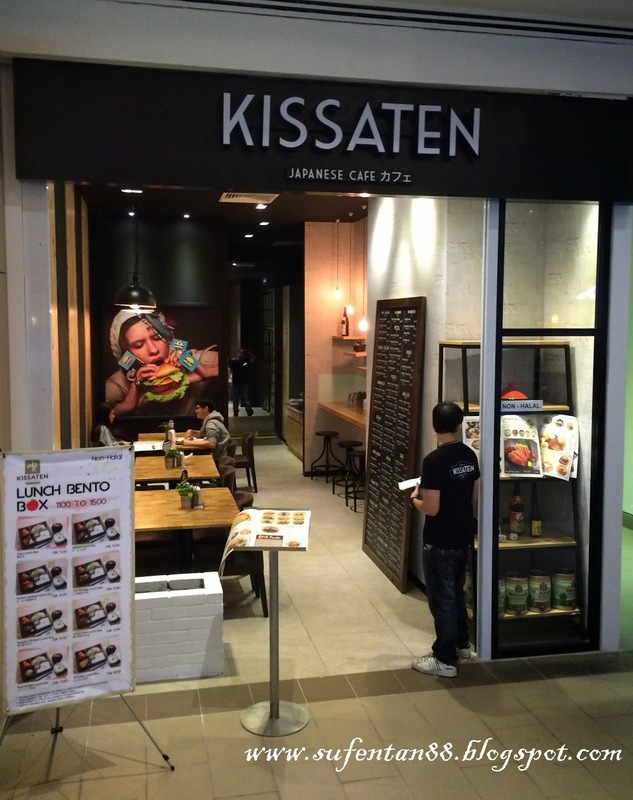 Kissaten is quite unique in a way, they are the few restaurants that actually served fusion cuisine of Japanese, Western and Local culinary. They started the business in Malaysia for quite sometime now and there are a few outlets in PJ and KL like Jaya One, Puchong IOI Boulevard and Lot 10 Hutong. The ambience is quite comforting despite it is super packed during dinner time. 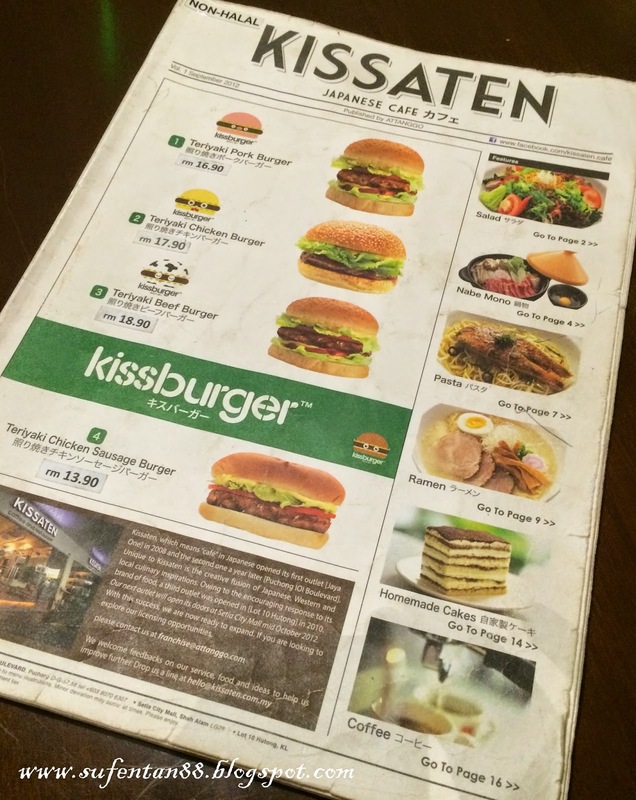 We have a hard time choosing our food as every photos shown in the menu seem to be mouth-watering. 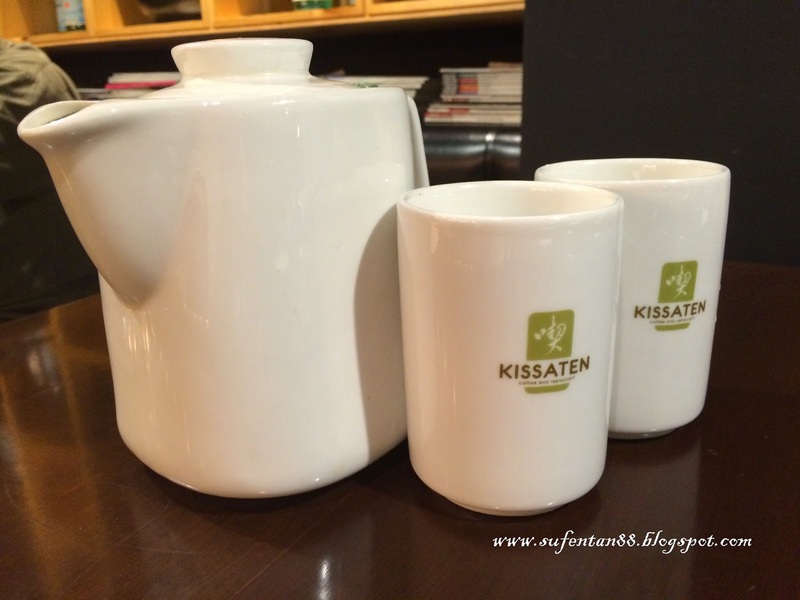 They also serve green tea per glass that costs around RM5.90. Since there are two of us, we decided to order in pot and it is refillable. It is served in Tajine Pot which believe to be able to keeps the nutrient of ingredients, bringing a healthy meal to customer. 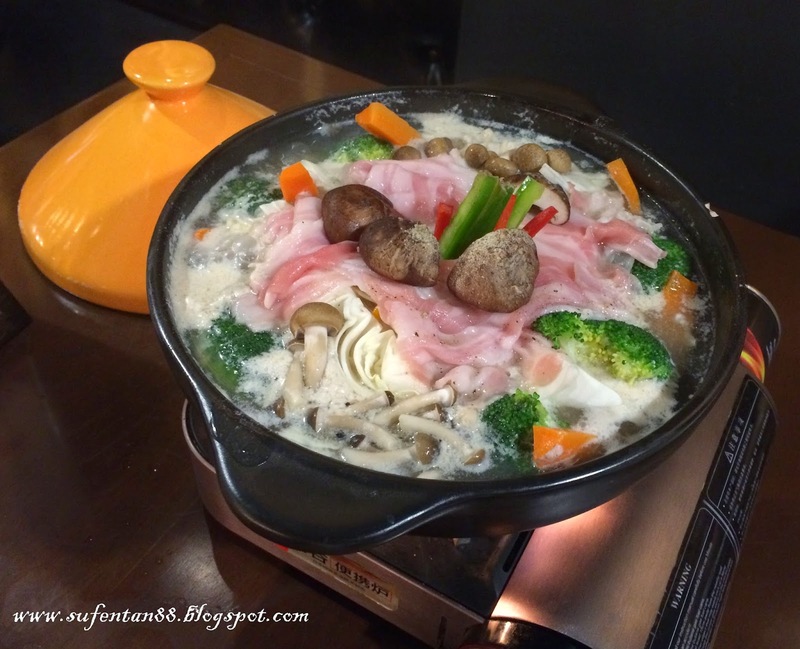 The Buta Yasai Healthy Nabe comes with lots of vegetables and fresh mushrooms, and slices of pork meat. Both of us love the clear soup base, light and mild, taste just nice with the combination of ingredients and not to forget a bowl of rice to go with it as well. The tomato sauce of spaghetti isn't that rich, mild but savoury enough. The sauce is lighter and watery, if you are use to thick tomato sauce, you might feels unsatisfying. 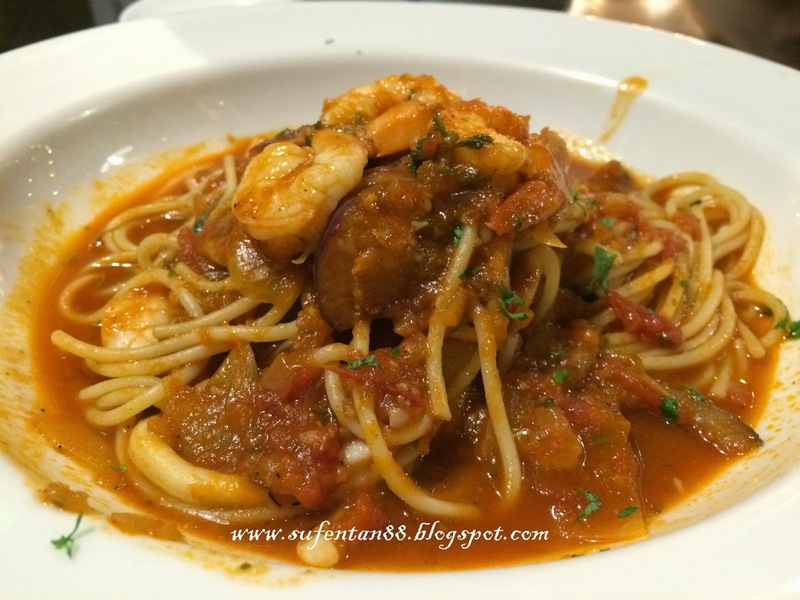 The spaghetti is accompanied with prawns, squids and egg plant. Simple and delicious! I was craving for dessert and decided to try out their banana crepe since it looks quite tempting from the menu's photo. 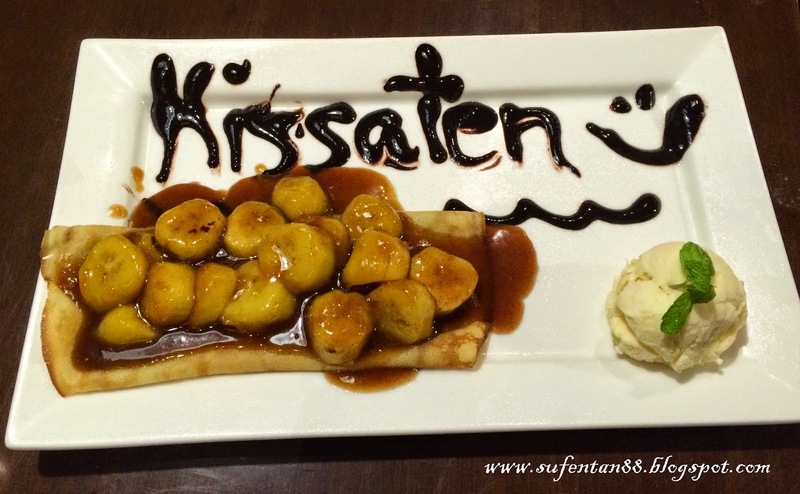 However the presentation of the dessert is quite shocking to us when served especially the ugly "Kissaten" word on top. It actually ruins the whole food presentation. But soon we forgot about it after we tasted it. It taste scrumptiously delicious! The crepe is top with banana, maple syrup and cinnamon powder, accompanied with a scope of vanilla ice-cream. I love when I combined a piece of banana with the crepe and mix it with the hot syrup and ice-cream, it just taste like heaven. I am quite happy with their food and will definitely coming back for more.